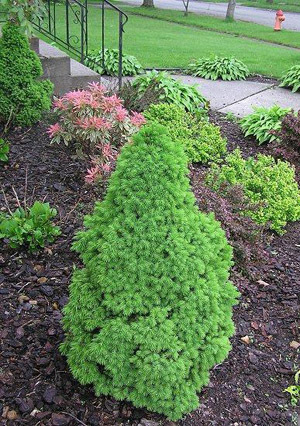 The Dwarf Alberta Spruce, Picea glauca 'Conica', is a miniature Spruce with bright green foliage that is densely branched, slow growing and retains a perfect conical shape without trimming. The Dwarf Alberta Spruce is a small, cone- shaped tree that grows very slowly (2 to 4 inches per year) and rarely needs pruning. Its dense, bright green foliage makes it attractive. It is primarily a specimen plant and is often used as a container plant. It does need protection from the winter sun in exposed sites in zone 4. If planted farther south, summer heat and humidity are not to its liking, so try to locate it where it gets some afternoon shade but otherwise good light. The north or east side of the house is probably the best location. Make sure it's planted in a fertile, well drained soil not allowed to get too dry during the summer. This is an excellent plant for adding structure, color and texture to your yard or garden. And if you have a small area, try this one in containers for that special place in your garden or patio.